Thank you for wanting to Sponsor a Senior. Your donation whether large or small, whether one-time or regularly is greatly appreciated. If you want to direct your donation to a specific senior citizen, choose the options of ONE-Time Direct or Recurring monthly - Direct option below. If you'd like to donate to help the general fund which will be voted on for distribution purposes monthly by our board of directors, and is based on funds available, needs of all our bequest submissions including those who chose not to publish their bequest story, select One Time - General or Recurring - General donation. 1. 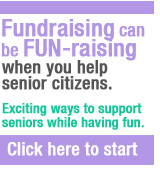 Click the following button to donate to a specific senior citizen one-time. 2. Click the following button to donate to a specific senior citizen on a recurring monthly basis. We would love to get the word out to those you may know that may also wish to contribute to this very needy cause that is still run entirely by volunteers so please share using the 'share' button at the bottom this page.